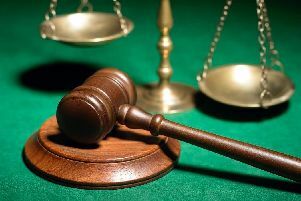 A Mixenden man suffered a blood clot on his brain after a “skewer-type” weapon was pushed into his eye socket during a street confrontation, a court heard. A jury at Bradford Crown Court heard today (Tuesday) that Stuart Sinclair, 37, was no longer in a fit state to give evidence during a trial and had no independent recollection of the events that February night. The prosecution allege that during a confrontation near a row of derelict shops on Stanningley Road, Mixenden, 45-year-old Mark Ryan assaulted Mr Sinclair with the “sharp, thin weapon”. Ryan, of Brow Bottom Lane, Mixenden, has denied a charge of causing grievous bodily harm with intent and also pleaded not guilty to the alternative allegation of unlawfully inflicting grievous bodily harm. Prosecutor Caroline Wigin said even though a friend of Ryan’s had stood between him and Mr Sinclair, the defendant lunged forward with the implement and it entered the complainant left eye socket just above the eye. Miss Wigin showed the jury brain scans which revealed the blood clot suffered by Mr Sinclair and also showed fragments of bone which had been pushed in by the implement. “The complainant has suffered significant brain injury and he does not have independent recollection of the events so the Crown is relying on the recollection of those who were with him at the scene,” said Miss Wigin. Ryan was arrested shortly after the incident and in a prepared statement he said he had been surrounded by Mr Sinclair and others. The defendant said he had been attacked by Mr Sinclair and denied having any weapon or causing any injury to the complainant. The trial continues and is expected to last about six days.